I was attracted to this book because of its title, then I thought it might be a Reformed position only on holiness, but then I was pleasantly surprised by reading the entire (but fairly short at 150 pages) book. DeYoung does a good job of encouraging Christians to seek holiness in their lives, and at the same time to avoid the extremes of license and legalism. DeYoung pastors University Reformed Church in East Lansing, Michigan and could have gone aside into Lordship Salvation, a Reformed view of Perseverance, or mixing up law and gospel. 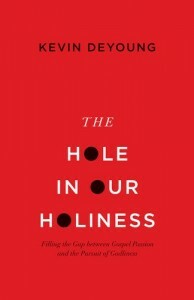 But again, DeYoung stays on target giving very helpful thoughts about the Christian and holiness. His explanation of Union with Christ, Saints and sexual immorality, and Repentance for the Christian are chapters that should help struggling believers. I think this book would be a great help for the struggles of the upcoming generation of believers in our churches.